Home | Jaw Pain | Does Your Jaw Hurt? A commonly overlooked part of the body, the jaw actually performs several useful functions that help us in our day-to-day activities. It helps us eat, chew, drink, talk, and do facial expressions effortlessly. Thus, when we experience jaw pain, these bodily functions are significantly impacted and impossible to ignore. This type of pain can have several different causes. On the plus side, medical professionals have an abundance of ways to detect the cause and address the issue. In today’s post, we’ll take a look at some of the reasons why our jaw aches. Temporomandibular joint (or TMJ) is located on either side of your jawbone. It serves as the hinge that links the jaw to the skull. 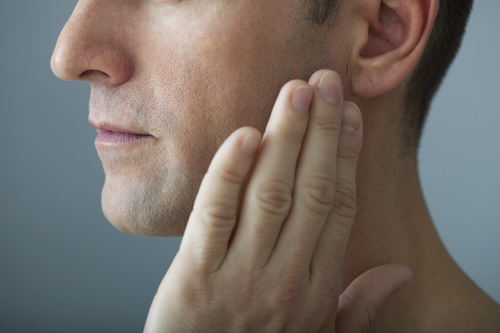 Similar to any other parts of the body, the temporomandibular joints can experience issues. According to the National Institute of Dental and Craniofacial Research, certain TMJ disorders can show a variety of symptoms. However, most of these disorders share a common symptom: jaw pain. This type of pain can manifest in a number of ways: difficulty opening the jaw, stiffness, locked-jaw feeling, and a painful popping or clicking when closing or opening the mouth. You may also experience an alteration in the way the lower and upper teeth fit. If you think you may have an issue with your temporomandibular joints, your doctor will conduct a physical exam. This check-up will also be accompanied by imaging tests (such as X-ray) to investigate what’s going on. Fortunately, the pain is usually temporary and doesn’t get any worse. Thus, the initial treatment for TMJ disorders is not as extensive. Anti-inflammatory medicine such as ibuprofen is often recommended. You may also use ice packs to lessen the inflammation. As for the diet, soft foods are ideal. Try not to open your mouth too widely for an extended period of time. You may also look into jaw exercises or a chiropractic treatment, which has helped many patients with TMJ disorder. Teeth grinding, also called bruxism, is a classic parafunctional activity. Parafunctional habits are the frequent use of a part of the body that is different from the most common function of it. Grinding your teeth occurs when you clench your teeth together too much without realizing that you’re doing it. This act can start a lot of tension in the teeth and jaw, including the muscles and ligaments that support the jaw. Over time, this can result in acute pain. Medical professionals are not entirely sure what the cause of bruxism is; however, it’s been determined that stress is a major contributing factor. Bruxism, while you are awake, can be frustratingly annoying and can cause a lot of pain. Still, at least you are aware that it’s happening and can try to avoid it. On the other hand, sleep bruxism can be more challenging to stop and prevent. Certain theories link sleep bruxism to arousal response, which is what happens when there is a change in the depth of your sleep levels (sleeping lighter or waking up). If you have suspicions of teeth grinding while you’re asleep, the doctor or dentist may advise you to get a night guard. This device serves as a protective layer between the bottom and top teeth to relieve tension. Additionally, ask your doctor if they have any tips to help alleviate stress. An impacted wisdom tooth, bite issues, or untreated cavities are just some of the dental problems that may be behind your TMJ disorder. Any of these issues will require a thorough check-up by your dentist. The bottom line is any type of jaw pain will need to be checked immediately. Additionally, these dental issues will need to be remedied right away not to compromise your oral health. Jaw pain accompanied by other symptoms has been linked to more serious and severe health issues. In some cases, jaw pain with chronic headaches is related to signs of heart attack, especially in women. Like we’ve mentioned, it’s fortunate that specific treatments are readily available to treat TMJ disorders. From wearing a night guard to physical exercises, chiropractic adjustments to heat and cold therapy, treating TMJ disorders will provide you peace of mind and better health.